Sherpa Tip: Always search for variations of the customer's name, including misspellings, before adding them. Add from a transaction: From the Select Customer dialog box, click Add (on the toolbar). 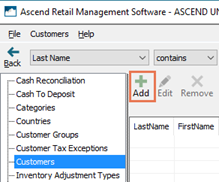 Add outside a transaction: From the Ascend Desktop, click the Customers tile. Then click Add (on the toolbar). Sherpa Tip: Click the Scan Drivers License icon (keyboard F7) to scan a customer’s driver’s license with the Zebra/Motorola DS4308-DL, DS6878-DL, or DS8178-DL model barcode scanner to enter customer information, as provided by the state. (required) Account Type: Select Individual if the customer is a person, or Company if an organization. (required) First Name: Enter the customer’s first name. This field is required even if Account Type Company is selected. (required) Last Name: Enter the customer’s last name (surname). This field is required even if Account Type Company is selected. Company: Enter the company name. This field is required if Account Type Company is selected. Email Address: Enter the customer’s email address. Phone 1: Enter the customer’s primary telephone number. Select the appropriate Phone Type. a. Home: Phone number is a home (landline) number. b. Mobile: Phone number is a mobile (cell) number which can receive SMS (text) messages. This option is selected by default. d. Fax: Phone number is a facsimile machine. f. Other: Phone number is another type not defined above. Phone 2: Enter the customer’s secondary telephone number. Select the appropriate Phone Type. a. Home: Phone number is a home (landline) number. This option is selected by default. b. Mobile: Phone number is a mobile (cell) number which can receive SMS (text) messages. Gender: Select the customer’s gender. This field may be required based on your Options. Birthday: Enter the date of the customer’s birthday. Account Number: This field is automatically populated based on your location’s Short Code. Enter a new number if you generate account information outside of Ascend, or click New to automatically generate a new number. Include in Communications: Check if the customer has agreed to receive marketing emails or mailings. Trek Card holder: Check if the customer has an active Trek Card. Hidden: Check to remove the customer from your system.Sherpa Tip: Customer data is not deleted, but will only display when Show Hidden is selected. Transaction data is not affected. Send Statements: Check if Purchase on Account statements should be generated for the customer. Address 1: Enter the first line (e.g. street address) of the customer’s billing address. Address 2: Enter the second line (e.g. unit number) of the customer’s billing address. City: Enter or select the city for the customer’s billing address.Sherpa Tip: When a ZIP/Postal Code is entered, the matching City and State/Province are automatically selected. State/Province: Enter the state or province for the customer’s billing address.Sherpa Tip: When a ZIP/Postal Code is entered, the matching City and State/Province are automatically selected. ZIP/Postal Code: Enter the ZIP or postal code for the customer’s billing address.Sherpa Tip: When a ZIP/Postal Code is entered, the matching City and State/Province are automatically selected. 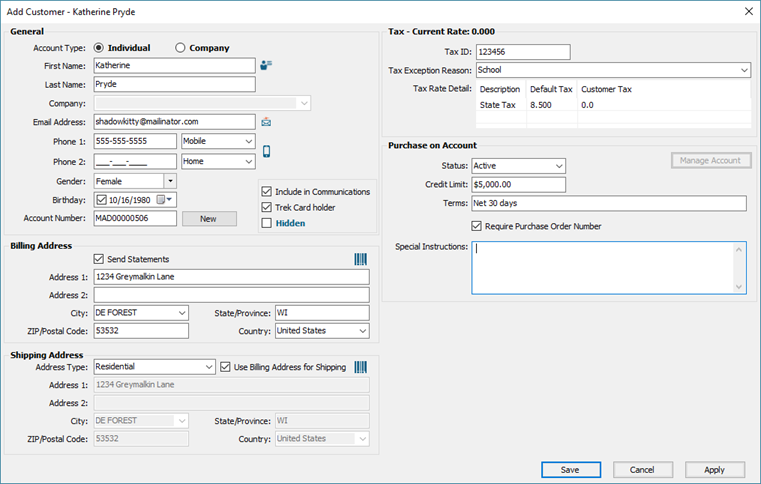 Country: Select the country for the customer’s billing address.Sherpa Tip: Countries must be activated before they can be selected; see How do I add a country? Address Type: Select Residential if the address is for a home, or Commercial if for a company. Use Billing Address for Shipping: Check if the Billing and Shipping addresses are the same. Current Rate: The current tax rate being charged to the customer displays in the Tax header. Tax ID: Enter the ID provided to prove the tax exception. Tax Exception Reason: Select the applicable exception reason (e.g. State Park).Sherpa Tip: Exception reasons must be added before they can be selected; see How do I add a Tax Exception Reason? Tax Rate Detail: The Default Tax and the current Customer Tax rates display in the grid. To apply an exception, click in the Customer Tax field and enter the appropriate rate. Status: Select the status of the customer’s account. a. Inactive: The customer does not have Purchase on Account privileges. b. Active: The customer can charge against a Purchase on Account balance. c. Suspended: The customer has had Purchase on Account privileges, but they are currently unable to use them (e.g. account is in arrears). d. Closed: The customer previously had Purchase on Account privileges, but they have since been revoked. Credit Limit: Enter the maximum amount the customer may charge. Terms: Enter the payment terms for the customer’s account (e.g. Net 30). Require Purchase Order Number: Check if a purchase order number must be entered when charging to the account. Special Instructions: Enter any additional comments about the customer’s account.